We heard two versions of the story behind the name 'Corner of Paradise'. 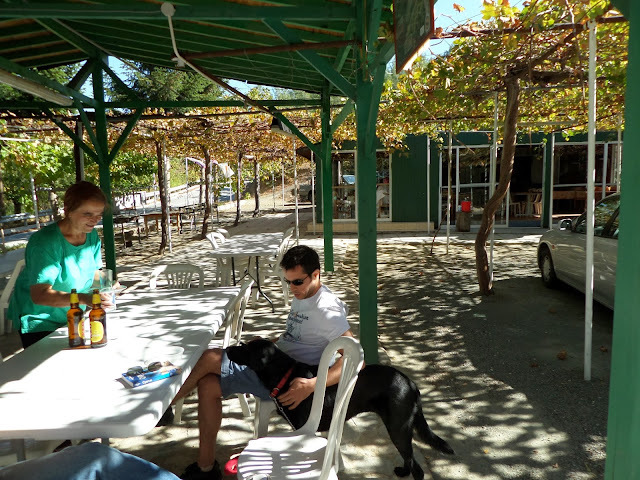 One owner told us that one hot summers day, a group of locals were sitting out on the terrace of the taverna, drinking cool beers in the shade of the vines that grow overhead. The climate is slightly cooler there, due to being in the mountains, while the natural spring behind the taverna provides water for the cherry trees in the surrounding fields. A friend passed by on his way from working in the fields below. He saw them all sitting there, enjoying the cool breeze and relaxing with their drinks, and he said 'this place is like a corner of paradise'. His wife, on the other hand, told the story with a difference. 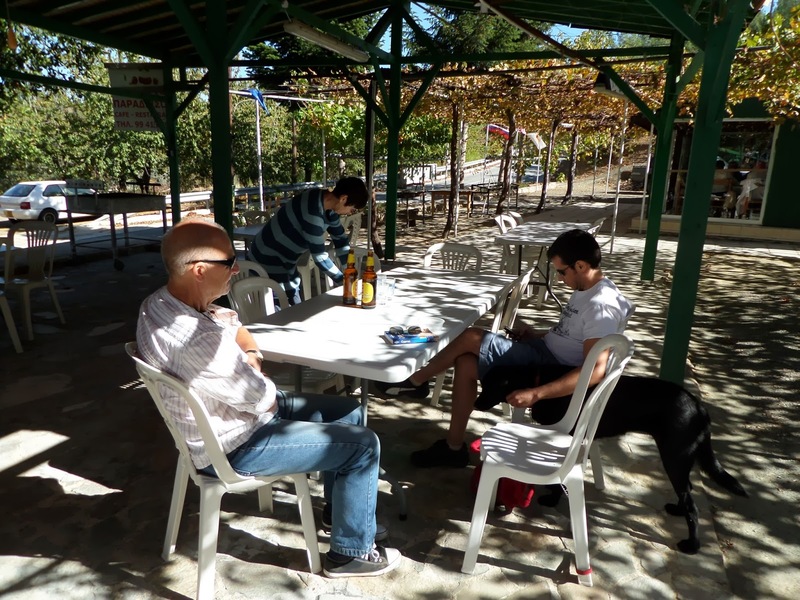 A similar scene: a summer day, a group of locals sitting out at the taverna with their beers and coffees, escaping the heat of the valleys and fields. Except, these customers were all the older residents of the area. All retired, all elderly, all just passing their time in the taverna. And someone, I don't remember who, made the comment that this taverna was like a waiting room... for Paradise. Whichever version was true, when we stumbled on this taverna after a long hike through the cedar valley, it seemed pretty close to paradise. I was on a mission to visit the village of Kampos (my Lonely Planet mentioned that very few tourists make it out that far, which sounded to me like a challenge! ), and I wasn't sure we were going to find anywhere to eat. This taverna is on the road just before Tsakistra, coming from the Kykkos Monastery. This area of Cyprus is extremely beautiful. It couldn't be more different from the busy coastal areas and towns - you see only mountains, one or two small villages, fruit trees, agriculture. The food at this taverna was excellent. We ordered up a feast: halloumi, locally harvested mushrooms, salads, grilled meats... and the owners kept bringing out dishes, on the house, that they wanted us to try (as well as some dubious homemade wine). It was also one of the cheapest meals I've had in Cyprus. And, Sage was a huge hit. The owner brought out an enormous bag of meat and bones for her. They showed us photos of various other dogs from the neighbourhood who also come by to enjoy the leftovers. The Taverna Corner of Paradise is open all year round. It's pretty remote, and takes a long time to get to, but it's well worth it if you're anywhere in the area.